Nowadays most people are connected to the Internet using a router instead of a modem. One of the main differences in using a router is your computer’s connection to the router is hidden behind it and not directly exposed to the Internet unlike using a modem. It is generally safer but also creates a huge problem which is a lot of applications that work over the Internet might stop working. The solution is to forward the port which can be a daunting task for a lot of users as it needs the correct IP address, port number and transport protocol (TCP/UDP) or else it won’t work. Fortunately the process of configuring port forwarding has gotten a lot easier through the years. Instead of connecting the router using a telnet client to view the text-based settings and manually typing commands to add a configuration, port forwarding is pretty much automatic these days thanks to Universal Plug and Play (UPnP). For automatic port forwarding using UPnP to work, both the software and router must support this feature. In this article we’ll show you how to add or check port forwarding in your router using a software and also to manage the port mappings of a UPnP router. Using UPnP is the easiest way to forward a port without making any configuration changes on the router. Some software that supports UPnP automatically enables this feature by default while some have options allowing you to choose whether to use it or not. An example is uTorrent where you can find the options to enable UPnP Port Mapping and NAT-PMP port mapping in is preferences. After enabling UPnP port mapping, it is equally important to make sure that it is working. In uTorrent, the Logger tab shows if the a port has been successfully mapped using UPnP when a download is started. 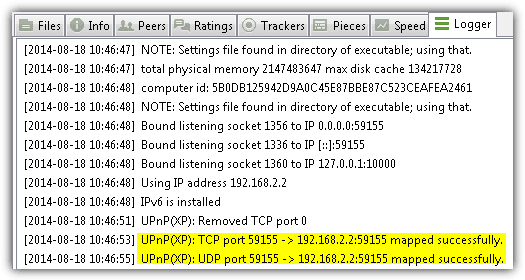 The screenshot below shows uTorrent successfully mapped both UDP and TCP port 59155. If for some unknown reasons the ports are not being mapped, here are 3 tools which you can use to automatically and easily create port forwarding on your router. If the application does not show the status of the port mapping, you can use a free and portable software called UPnP PortMapper. UPnP PortMapper is a Java application that can run on Windows, Linux and Mac OS X as long as you have Java installed. Simply run UPnP PortMapper and click the Connect button which will start searching for routers in your network, connect to it and get all the port mappings. Not only does PortMapper allow you to view forwarded ports, you can also add or remove port mappings. To create a port mapping, click on the Create button from the Port mapping presets area and an “Edit Port Mapping Preset” window will appear. 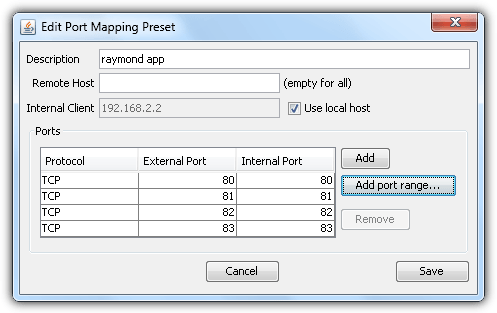 Enter a description for the port mapping, you can leave the remote host empty, and either click on the Add button to add a single port or a range from the “Add port range” button. Once you’ve finished adding the port mappings, make sure you select the preset and click on the “Use” button for the change to take effect. The adding port mappings feature is very useful and convenient if the application you’re using requires port forwarding but does not support UPnP. This saves you the trouble of logging in to your router’s administration interface and manually adding a port forward. The only drawback is the port mapping is not permanent. 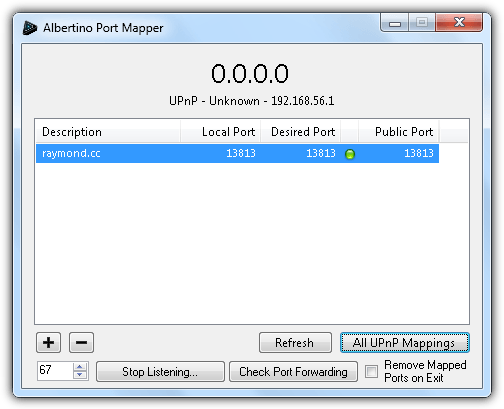 Albertino Port Mapper is a free and portable utility that does pretty much the same as UPnP PortMapper except it does not run on Java. Firing up the program will automatically attempt to determine if UPnP is supported on your router. The program itself is self explanatory. To add a port mapping, simply click on the plus icon, enter the local and public port, select the protocol and optionally enter a description for this mapping. Click the Add Mapping button and the port will start forwarding instantly. You can view all the UPnP mapped ports by clicking the “All UPnP Mappings” button. The only feature that we’re unsure of is the “Start Listening” button and the numeric up/down spinner beside it. Another tool that can automatically help to setup port forwarding in your router is Simple Port Forwarding. Unlike UPnP PortMapper and Albertino Port Mapper, Simple Port Forwarding works like a web macro that automatically logs in to your router’s web based administration page using the supplied login information and makes changes directly into your router. Obviously Simple Port Forwarding will only work on routers that are listed in its database (currently 3075 routers) because every automated step has to be accurate or else the setting up of port forwarding will fail. If your router is not listed, you can use their “Router Screen Capture” tool to capture screenshots and HTML code of each page of your router’s configuration and send it to be included in their database. Additional Notes: There are two shareware (PFConfig by Portforward.com and Router Port Forwarding) which we’ve found that claims to automatically configure router and add port forwarding but unfortunately it is not possible to test since the trial version restricts you from adding a port forward. I’m a total noob regarding this issue so after surfing on portforward dot com and not being able to follow their instruction then on their web site I found Portforward Network Utilities they say it can set a static address also it can go back to a dynamic one. Has anyone tried it and how it compares with these 3 applications here? Thank you so much Mr. Raymond. You so best!!! !